Since time immemorial, Mount St John has been a spiritual site. The church dedicated to Saint John the Baptist was the mother-church for the surrounding parishes. From 1464 to 1542 the Mount was the seat of the Order of the Bretheren of St. John of Jerusalem. Due to their large income, (the great tithes) seven priests could accommodate and feed seven destitute parishioners. Even after the destruction of both castle and church, St John's day (on June 24th) remained an important holiday. Up until 1794 a hermit lived on the mount and read mass in the chapel. In his 'Historia Luxemburgensis' Jean Bertels -who later became abbot of Echternach- described a procession taking place in the 16th Century in honor of St. John. It was famous for drawing vast numbers of faithful pilgrims to the mount. Many afflicted would dance to various tunes to the point of exhaustion, in this way imploring the help of Saint John for a cure. Note the striking similarities with the dancing procession in Echternach. The festival was often accompanied by a market on the mount, as revealed in archive texts and through excavations in which many coins and pottery fragments were found. Nowadays, the annual procession of St. John reminds us of this centuries-old tradition. At present, we don't have any definite data neither about the origins nor about the appearance of the first castle on Mount St. John. Excavations have revealed Gallo-Roman substructures below the medieval fortifications. The first castle belonged to the lords of Gymnich and was located in Dudelange. It was destroyed around 1400 by the Duke of Bar. The construction of the castle had begun in the early 15th Century. The walls uncovered during the excavations show significantly different construction periods culminating in the castle of the 16th Century (Gothic and Renaissance). 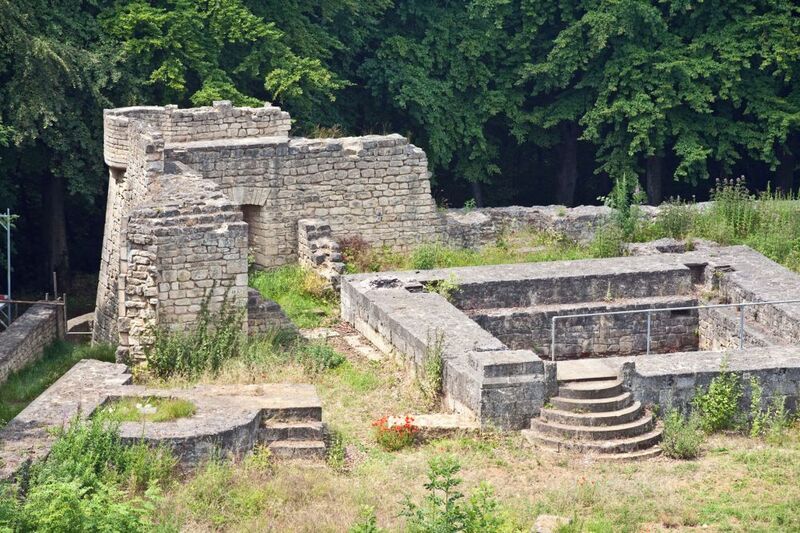 The square stone blocks and reliefs show that the Lords of Gymnich, Boulay, Neufchatel, Hunolstein and Isenbourg invested heavily in both the fortifications and the luxuries of their castle. Various documents describe it as a very 'strong place' -a mighty castle- famous for its feasts. It deteriorated dramatically when from 1542, the kings of France François 1er and Henry II made war on Emperor Charles Quint (Charles V) when it was conquered and reconquered many times before its final destruction in 1552 after which it lost any strategic value. Subsequently, the ruins were used as a quarry for the nearby villages. 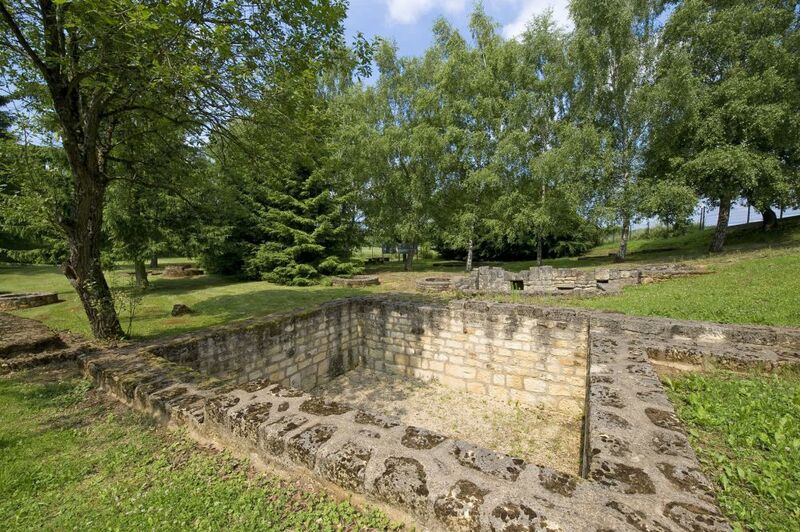 In the 1970s, the Friends of History of Dudelange and Mount St. John dug out the remains of the castle and uncovered the foundations of various towers, the palace, houses, stables and outbuildings; three wells and a cistern were partially excavated. The moat and the access to the castle are still visible. However, the castle still holds many legendary secrets like that of the Virgin of Mount St John, who -transformed into a snake- awaits her saviour every seven years.